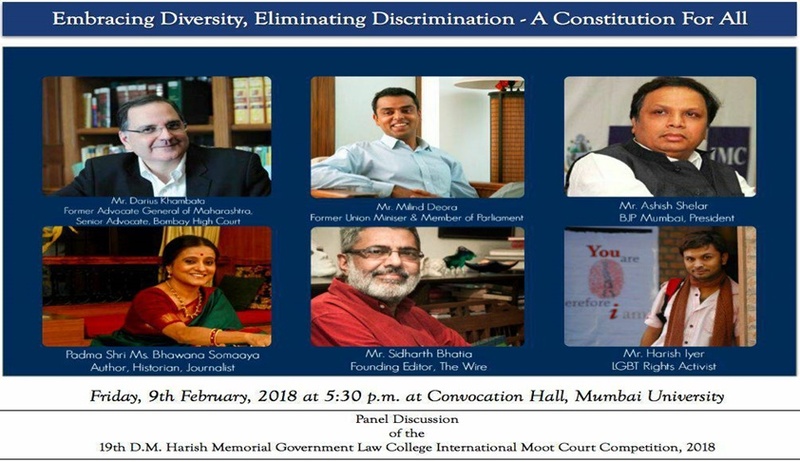 The DM Harish Foundation, in association with the Moot Court Association of Government Law College, Mumbai, organizes a panel discussion as a part of the DM Harish Memorial Government Law College International Moot Court Competition every year. The topic for the panel discussion this year is Embacing Diversity, Eliminating Discrimination – A Constitution for All. The discussion aims at tackling issues faced by various stigmatized communities. The panel discussion will be held on 9th February, at Convocation Hall, Mumbai University, Churchgate at 5:30 PM. Entry is open to all. The panel discussion is a precursor to the 19th DM Harish Government Law College International Moot Court Competition, 2018 instituted in memory of the late Mr DM Harish, a distinguished advocate and a renowned authority on Income-Tax law in India. Today, known popularly the over the world as ‘DMH’, the event has been acclaimed as a prestigious international moot court competition.